IN FOUNDATION LANGUAGE, WHO ARE YOUR “CONSTITUENTS”? JUST LIKE HAVING a clear mission and theory of change, knowing who you serve is one of the building blocks of an effective evaluation framework for nonprofit news. If you’re a local newsroom, you serve a geographic market. How many people live in your city or your region? If you specialize in political reporting, how many lobbyists, staffers, lawmakers and politicos are around? If you specialize in a particular topic, like education or health, what is the potential audience for your work? News organizations—nonprofit or otherwise—can’t thrive if they try to be all things to all people. The more you can define your target audience, the better you can estimate its size, and how many you’re reaching. Just like a business, your goal is to get as much market share as possible. In this guide, we’ll help you evaluate the impact of your work through three lenses: What did you do? Who did you reach? What happened? Before we get started, open up your calendar and set a recurring weekly reminder to gather and analyze your organization’s metrics. Set another recurring reminder to review the metrics you gather on a quarterly basis to determine if you’re looking at the right numbers. It’s easy to put these tasks off when you’re faced with a constant barrage of fundraising deadlines and editorial work, but if you keep up with it week by week, when grant report time rolls around, you can spend your time thoughtfully reporting your impact, rather than hustling to find all of the different numbers from the various sources. The information you gather should be shared on a regular basis with staff members, whether it’s in a weekly email update or discussion at staff meetings. Getting Specific: What Did We Do? The first question you want to answer is: What did we do? Or, in other words, what did we cover? The answer will include a total number of stories and details of that coverage—how many stories did you produce? What communities did you cover? What topics did you focus on? The easiest way to do this is by establishing an internal list of stories. Your content management system may have this capability, but if not, a Google spreadsheet will do the job. partner/collaborations: Keep track of who you worked with and the nature of the collaboration. Did you split the work evenly? Did a newspaper provide images for your story? Was it a tip from a news organization lacking the resources to complete the story? any other characteristics that are critical to your coverage goals (minority communities covered, neighborhoods, etc.) story elements, such as multimedia, interactive databases, etc. Finally, you should track the quality of your work as recognized by others. Receiving awards and honors for stories proves to your funders, readers and supporters that you are producing professional, high-quality coverage. Keep track of any instances in the same spreadsheet or a detailed page on your website. InvestigateWest has won nearly three-dozen journalism awards since we began publishing in 2010. Goal Setting: Who Did We Reach? There are two main ways that many nonprofit news organizations reach their target audience. The first is DIRECT DISTRIBUTION through your website and social media channels. The second is PARTNER DISTRIBUTION, or distribution through partner news organizations. Each is tracked differently, but together they give a general view of who you reached. To track growth and changes over time on your website, pull the numbers you care about on a regular (weekly is ideal, monthly is okay) basis and compile them in a “digital dashboard” spreadsheet. The exact numbers should be tailored to your organization’s goals, but may include pageviews, sessions and/or users, and engagement action analytics, like polls, interactive databases and photo galleries. More details on web metrics and what they mean can be found in our previous guide, Web Metrics: Basics for Journalists. If you use Google Analytics, you can set up a custom dashboard that’s e-mailed to you weekly. This digital dashboard should also contain social media and other engagement tool analytics. Track Facebook fans, Twitter followers, and email newsletter subscriber growth, and any metrics that are important to your engagement strategy (i.e., Twitter retweets, FB shares, newsletter open and click through rates, etc.). 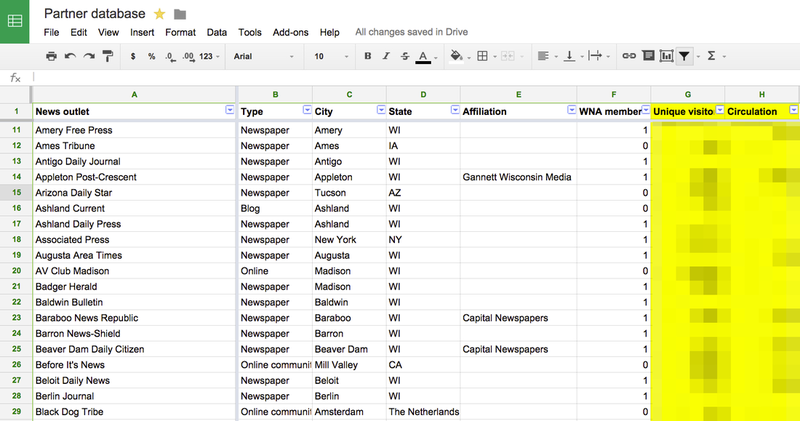 Use two different spreadsheets to track the use of your content by other news organizations. Now it’s time to populate your story tracker. The way you distribute your content will determine how you should track its use. Jason: At InvestigateWest, we work with more than a dozen media partners to produce and distribute our stories in the Pacific Northwest. Lauren: At WCIJ, we give our content away for free to news media in Wisconsin. 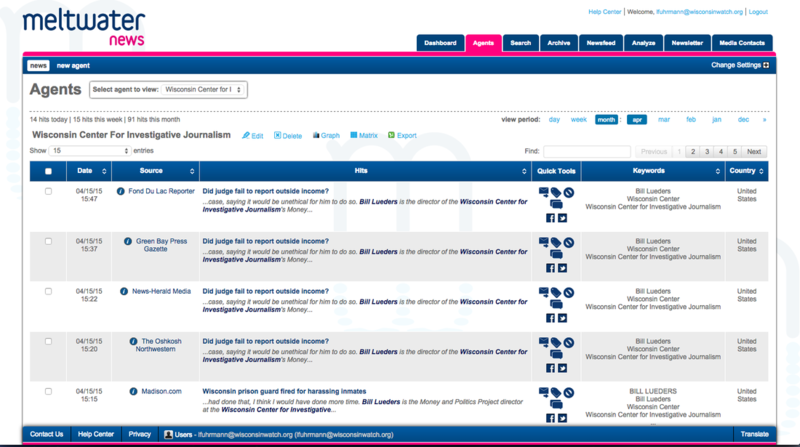 More than 230 news organizations have used our content. Partners log in to our website and download what they want to use. To estimate the size of our reach, we search for pickups and citations of our work online, in print and broadcast. If you have content agreements with a small number of organizations, like InvestigateWest, try to establish a relationship with their analytics staff to request pickup details and metrics on your content on a regular basis. You can accomplish this by calling or emailing each person to request specific numbers, or sharing a Google Form for them to fill out that will feed into a Google Spreadsheet. If they provide web analytics by story, keep track of those in the “Story tracker” worksheet. Otherwise average monthly pageviews, circulation and broadcast details can be kept in the “News organization” database. For partners, the number of pageviews isn’t as important as who the partner is and the implied audience it reaches. If you have too many partners to request analytics from each, it’s time to get searching! 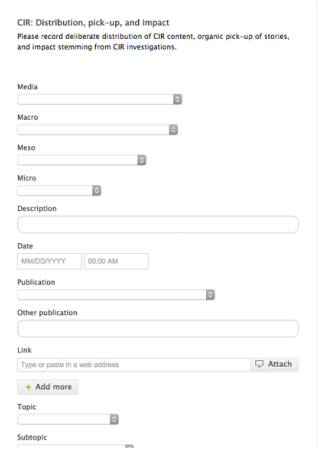 Set up GOOGLE ALERTS for all variations of your name, reporters’ names and story-specific keywords. To find results that Google Alerts may miss, search for the same keywords on different search engines and the top 10 news sites that use your content. Alternatively, if you have the budget for it, use a paid clipping, or media monitoring, service like MELTWATER and VOCUS. Media mentions will be compiled for you, along with audience estimates from ComScore and Compete. You should also check with newspaper associations in your area to see if they offer print monitoring or a searchable archive of their member newspapers. We’re going to shift away from quantitative analytics and talk about story vectors, i.e., news with a direction and a velocity. You want to prove to your funders that your work is contributing constructively to the conversation and moving public opinion and policy. Anecdotal evidence of impact that resulted from your work should be compiled in a spreadsheet or database similar to, and ideally linked to, those you’ve already created. One strategy to compile these anecdotes is an online form shared with all staff members to submit examples of impact. One example is CIR’s Outcome Tracker (shown on the left). 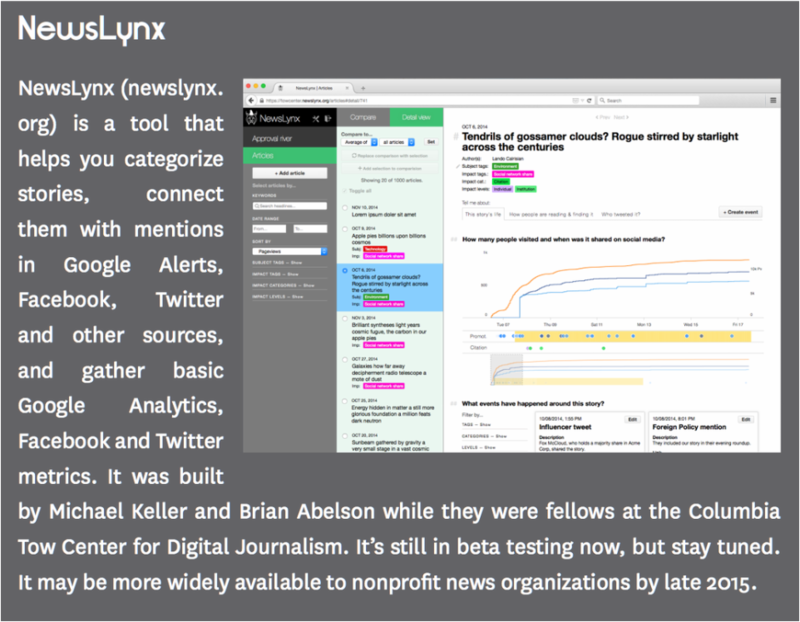 You might want to try classifying these qualitative indicators with the OFFLINE IMPACT INDICATORS GLOSSARY developed by the Center for Investigative Reporting, together with Columbia University’s Tow Center for Digital Journalism and the Media Impact Project. The glossary is currently available on the Media Impact Project’s website at bit.ly/impactglossary.